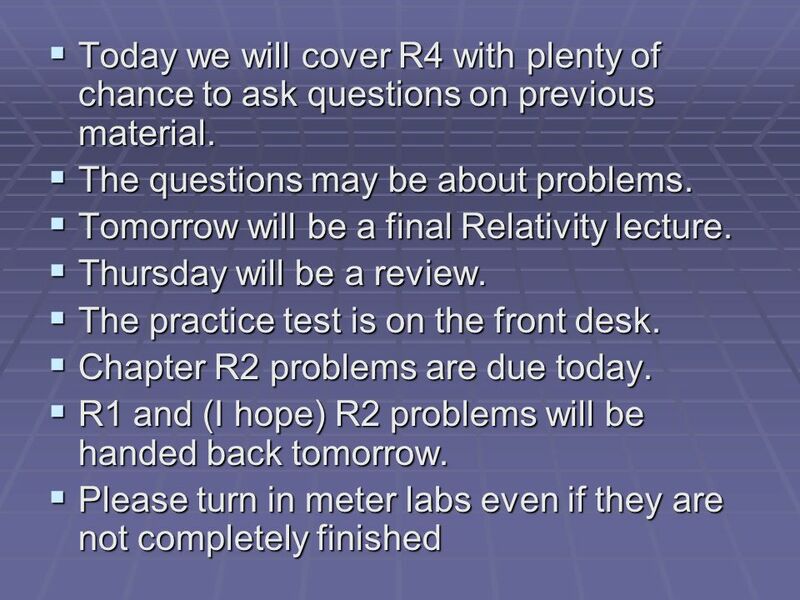  Today we will cover R4 with plenty of chance to ask questions on previous material.  The questions may be about problems.  Tomorrow will be a final. 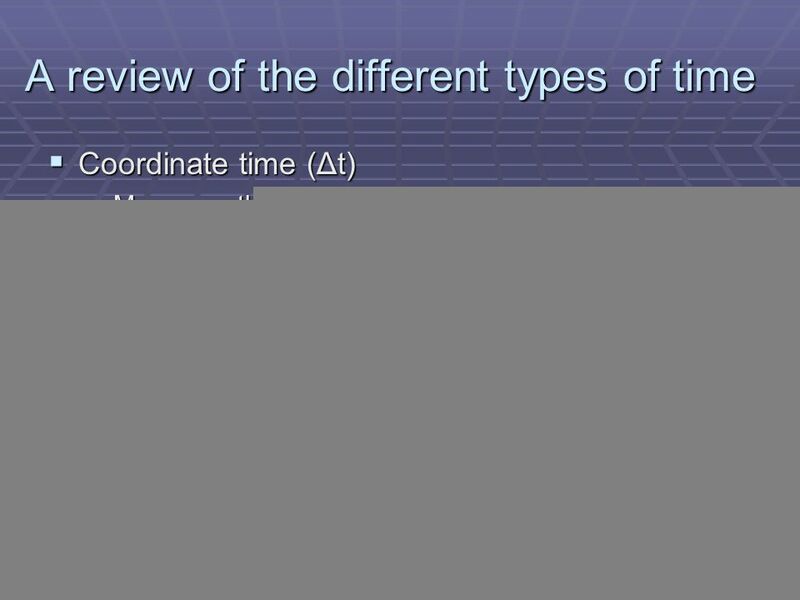 4 A review of the different types of time  Coordinate time (Δt)  Measures the time between two events in the same inertial coordinate system  Proper time (Δ τ)  Depends on the spacetime path taken to get from one event to another. 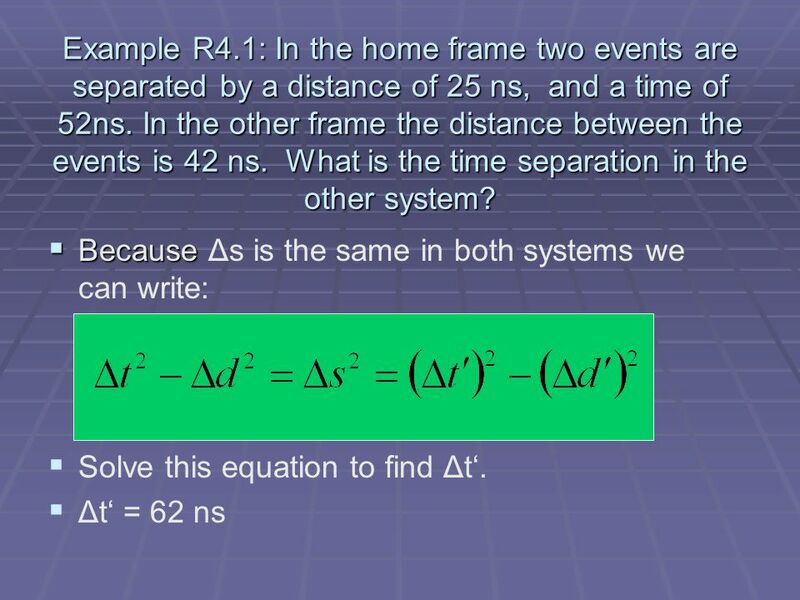  Spacetime interval (Δs)  The unique time between two events measured by an inertial clock present at both events  This is the time the metric equation calculates. 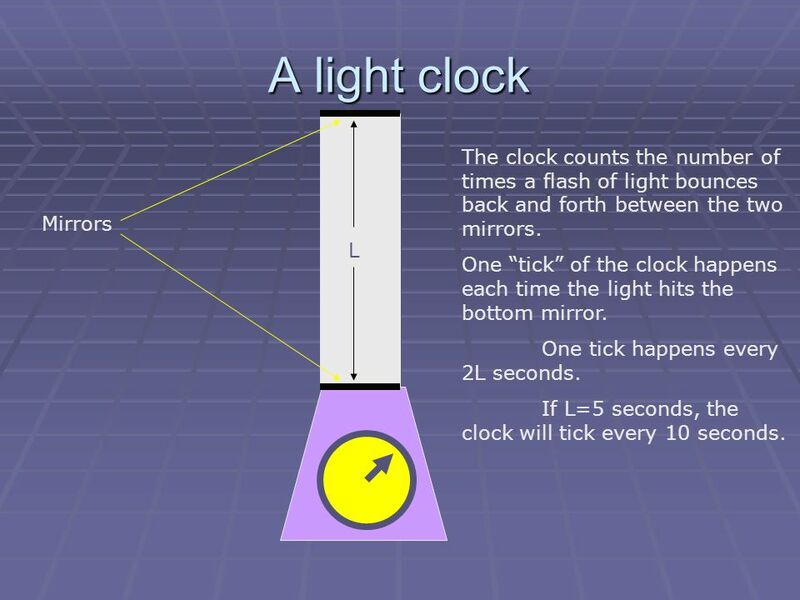 5 A light clock Mirrors L The clock counts the number of times a flash of light bounces back and forth between the two mirrors. One “tick” of the clock happens each time the light hits the bottom mirror. One tick happens every 2L seconds. If L=5 seconds, the clock will tick every 10 seconds. 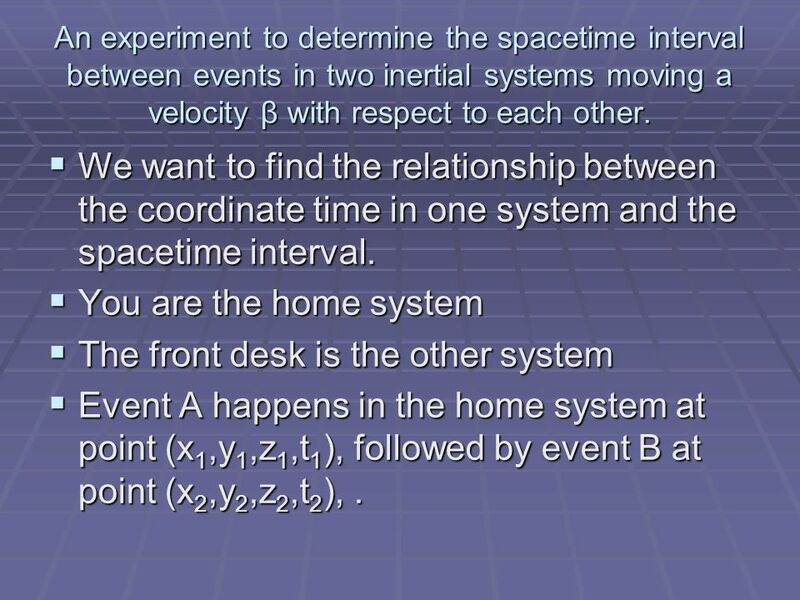 6 An experiment to determine the spacetime interval between events in two inertial systems moving a velocity β with respect to each other. 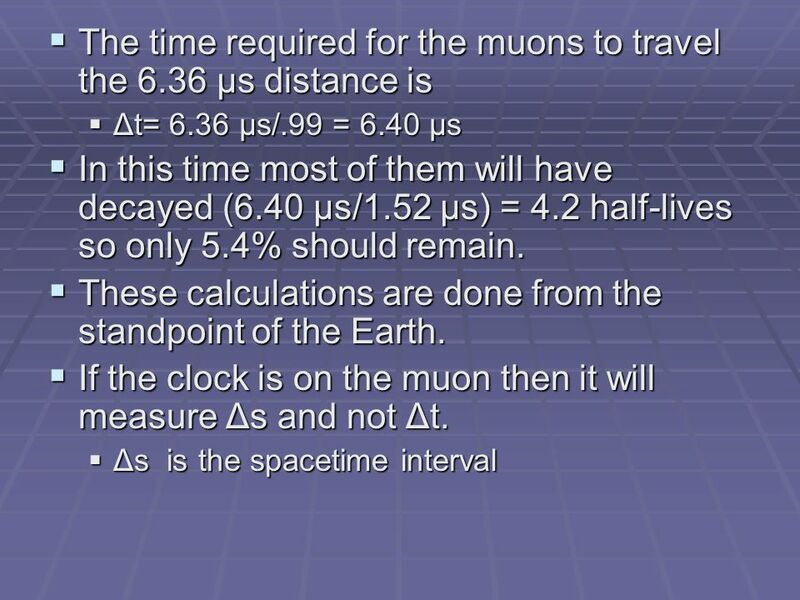  We want to find the relationship between the coordinate time in one system and the spacetime interval.  You are the home system  The front desk is the other system  Event A happens in the home system at point (x 1,y 1,z 1,t 1 ), followed by event B at point (x 2,y 2,z 2,t 2 ),. 9  Because in our coordinate system the speed of light = 1, then the coordinate time is just the distance traveled. 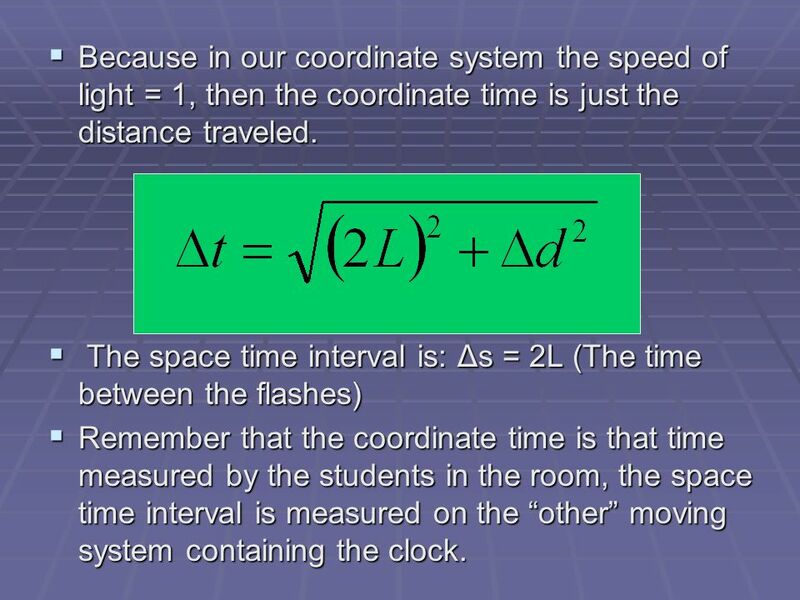  The space time interval is: Δs = 2L (The time between the flashes)  Remember that the coordinate time is that time measured by the students in the room, the space time interval is measured on the “other” moving system containing the clock. 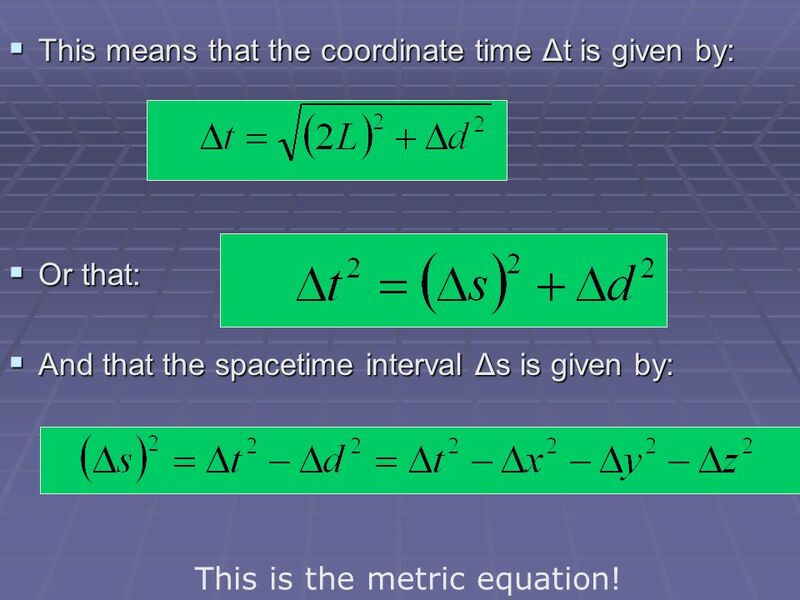 10  This means that the coordinate time Δt is given by:  Or that:  And that the spacetime interval Δs is given by: This is the metric equation! 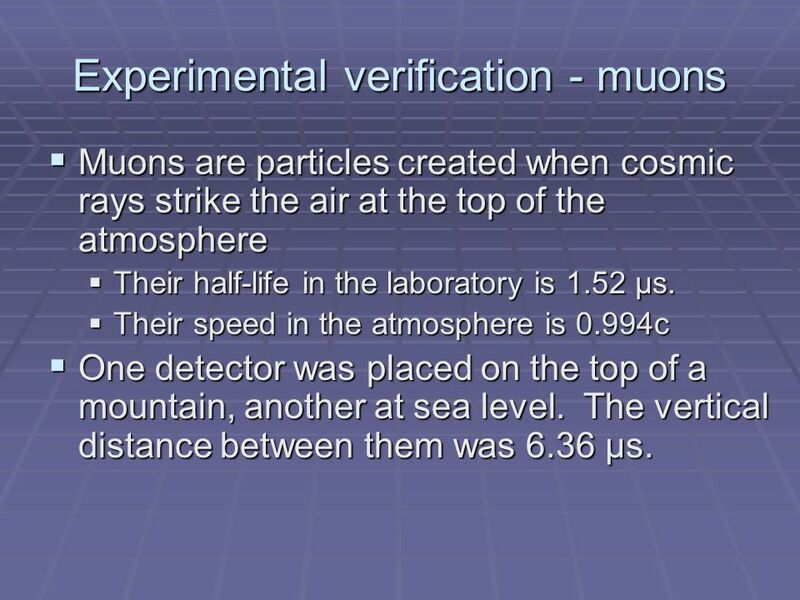 11 Experimental verification - muons  Muons are particles created when cosmic rays strike the air at the top of the atmosphere  Their half-life in the laboratory is 1.52 μs.  Their speed in the atmosphere is 0.994c  One detector was placed on the top of a mountain, another at sea level. The vertical distance between them was 6.36 μs. 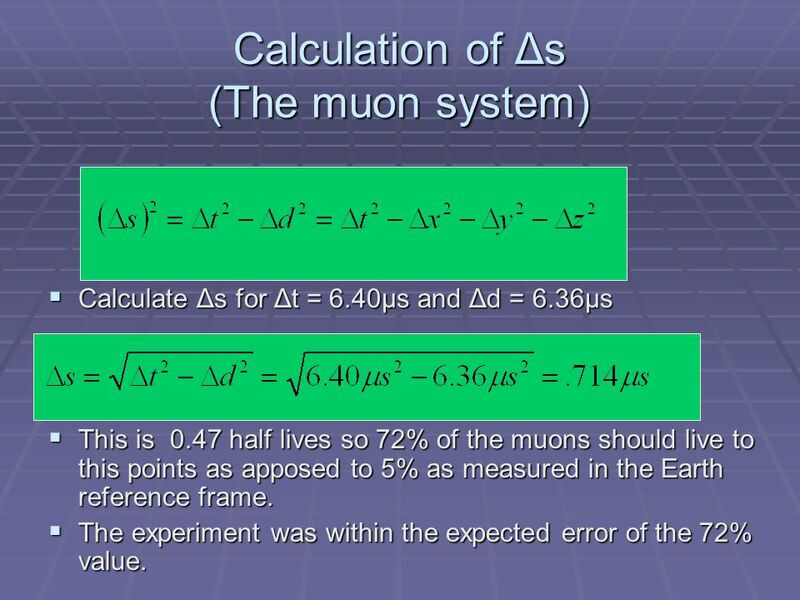 13 Calculation of Δs (The muon system)  Calculate Δs for Δt = 6.40μs and Δd = 6.36μs  This is 0.47 half lives so 72% of the muons should live to this points as apposed to 5% as measured in the Earth reference frame.  The experiment was within the expected error of the 72% value. 17  Which time are we trying to find? 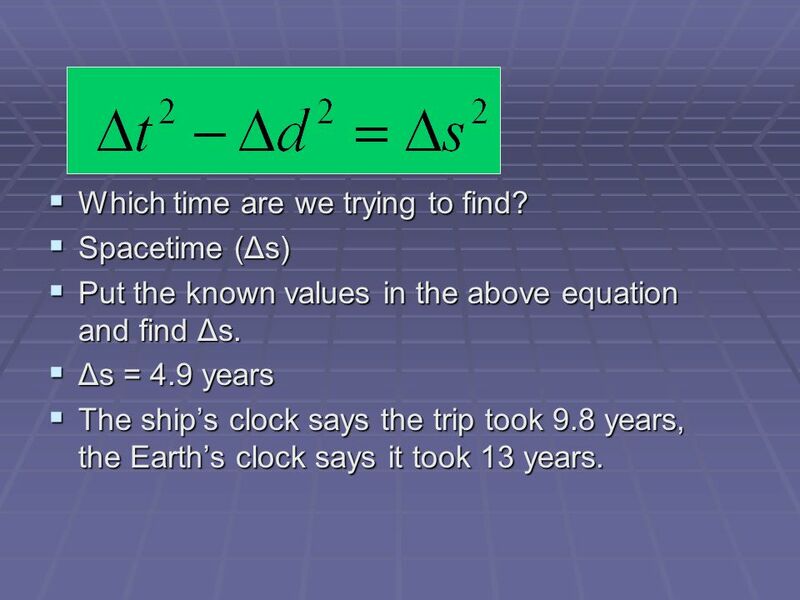  Spacetime (Δs)  Put the known values in the above equation and find Δs. 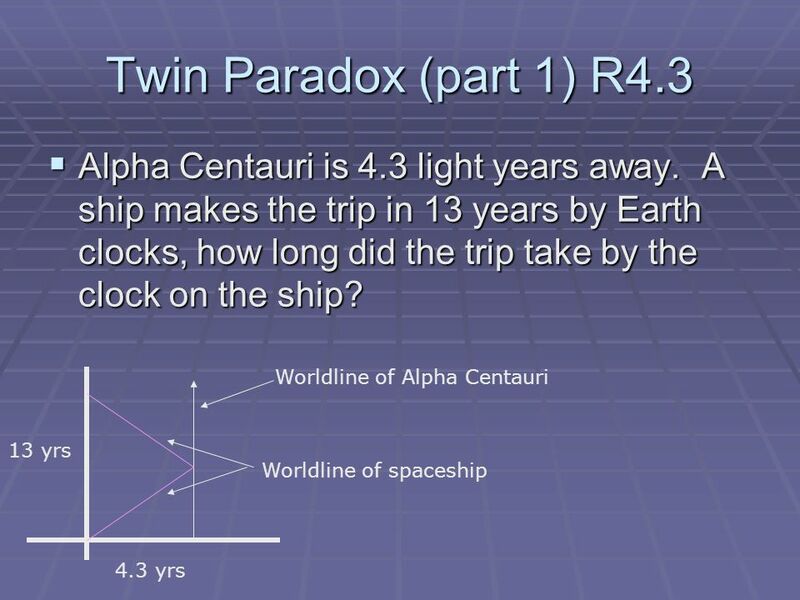  Δs = 4.9 years  The ship’s clock says the trip took 9.8 years, the Earth’s clock says it took 13 years. 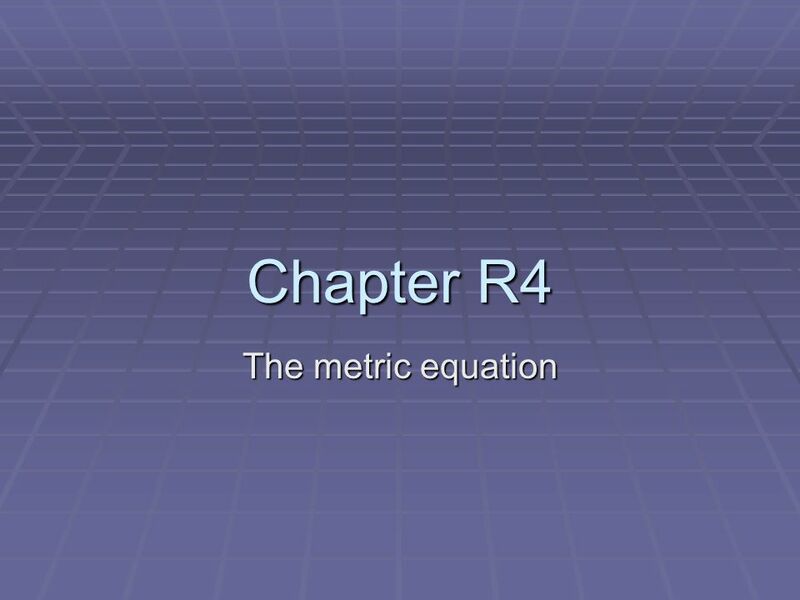 Download ppt " Today we will cover R4 with plenty of chance to ask questions on previous material. 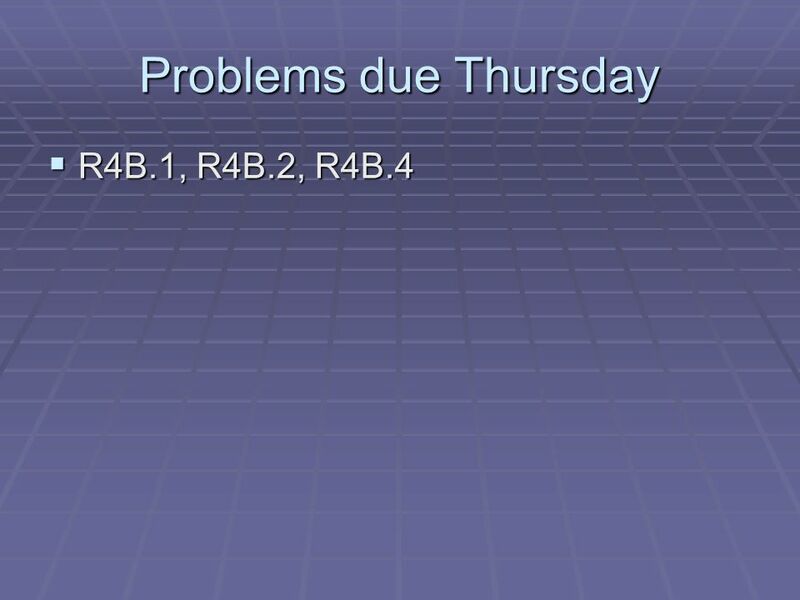  The questions may be about problems.  Tomorrow will be a final." 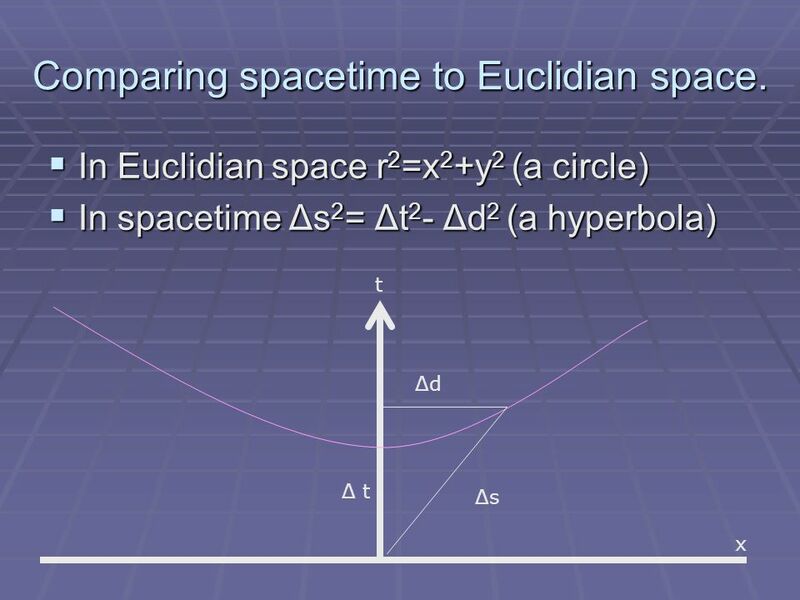 Building Spacetime Diagrams PHYS 206 – Spring 2014. Fisica Generale - Alan Giambattista, Betty McCarty Richardson Copyright © 2008 – The McGraw-Hill Companies s.r.l. 1 Chapter 26: Relativity The Postulates. 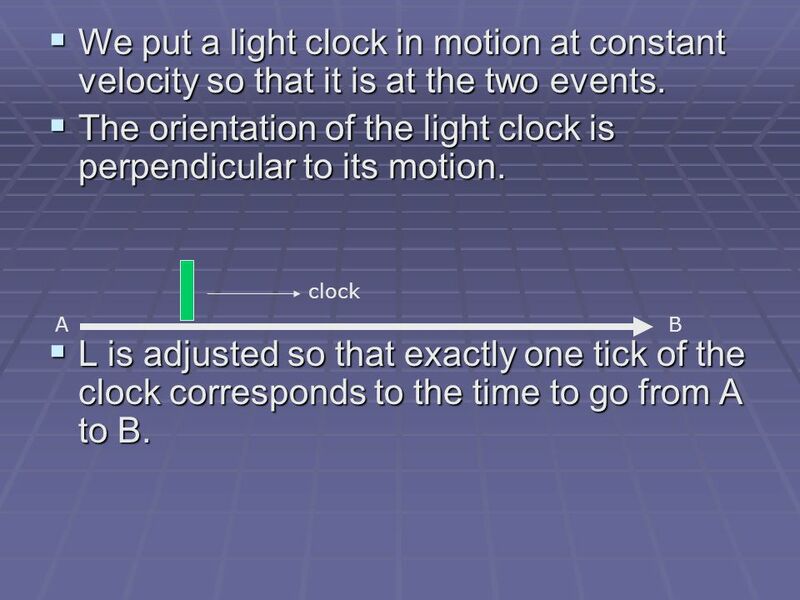 Time dilation D.3.1Describe the concept of a light clock. D.3.2Define proper time interval. D.3.3Derive the time dilation formula. D.3.4Sketch and annotate. Wednesday, October 24: Midterm #1 Material covered: Events, reference frames, spacetime The interval Simultaneity (and relativity thereof) Lorentz transformations. 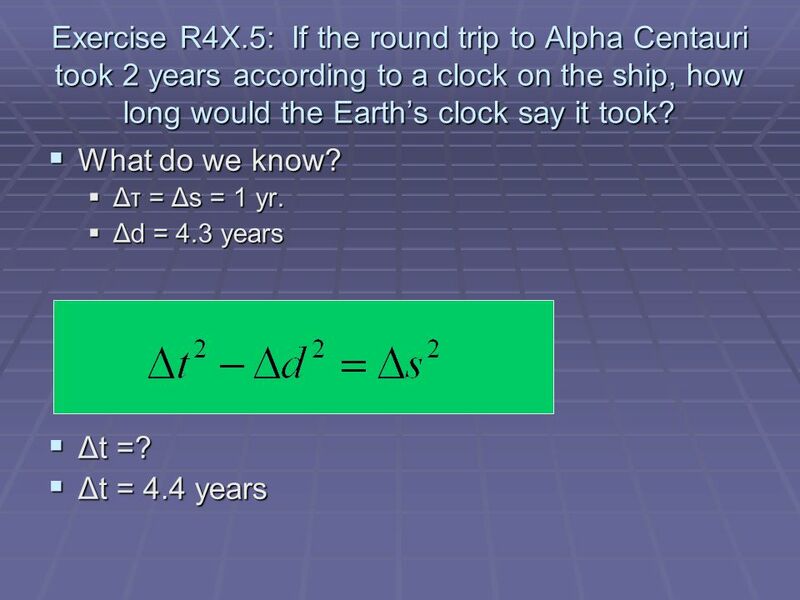 1 Special Relativity 2. 2 Topics l Recap l Length Contraction l Cosmic Ray Muons l Spacetime l Summary. 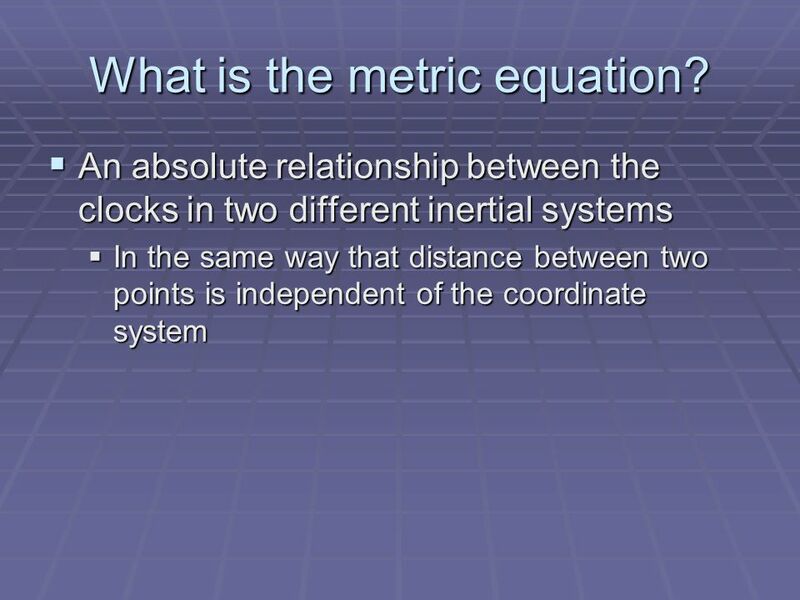 Physics 311 Special Relativity Lecture 2: Unity of Space and Time Inertial Frames OUTLINE Same unit to measure distance and time Time dilation without. 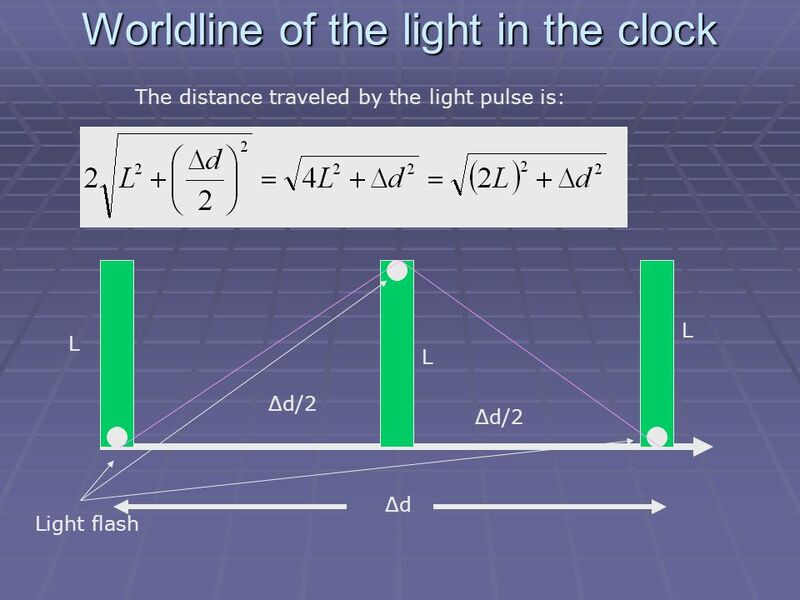 Physics 311 Special Relativity Lecture 5: Invariance of the interval. Lorentz transformations. OUTLINE Invariance of the interval – a proof Derivation. SPECIAL RELATIVITY -Postulates of Special Relativity -Relativity of time –> time dilation -Relativity of length –> length contraction © 2005. 1 Length contraction Length measured differs from frame to frame – another consequence of relativistic effect Gedankan experiment again! Lecture 12 Special Theory of Relativity II ASTR 340 Fall 2006 Dennis Papadopoulos. Event P is shown by a small x. At what time (in the primed frame) does P occur? A] at ct’=1 B] at ct’=2 C] at ct’=3 D] at ct’=4. Principle of special relativity Their is inconsistency between EM and Newtonian mechanics, as discussed earlier Einstein proposed SR to restore the inconsistency. The laws of physics are the same in any inertial (non- accelerating) frame of reference Galileo & Einstein would both agree (at terrestrial speeds.) F=ma.